A big congratulations to Councilwoman Abbe Land on her new position as CEO of The Trevor Project! Abbe has been a steadfast supporter of better bike infrastructure, due in large part to her background in expanding healthcare access, particularly for under-served communities. For example, a recent study by the University of Wisconsin showed that if people did half of their short errands by bike, the upper midwest would save 1,100 lives and $7 billion in healthcare. Between 1966 and 2009, the number of children who bicycled or walked to school fell 75%, while the percentage of obese children rose 276%. In Copenhagen, every mile of cycling yields $1.30 in health benefits; and closer to home, CycLAvia’s health benefits have been shown to outweigh program costs. And of course, it’s no surprise that SoCal studies show that children living near freeways have underdeveloped lungs, leading to respiratory disease for the rest of their lives. 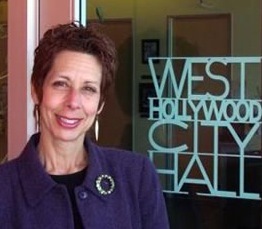 WeHo owes a big debt of gratitude to Abbe Land for pressing for the formation of the Bike Task force, and The Trevor Project could not have asked for a more committed, caring leader. Three cheers!